In the modern business world, non-HR professionals are required to share human management responsibilities in their organisations. They need to learn and apply critical human resource management (HRM) solutions to make more effective personnel decisions. As a result, they are engaged in the HRM processes and practices including recruitment & selection, training & development, performance management and handling grievances. PROCLAD Academy’s Human Resource Management for Non-HR Professionals training course is intended to provide the participants with critical knowledge and skills in human resource management to help them lead their teams more effectively and confidently, improving the overall performance of their organisation and job satisfaction of the team members. 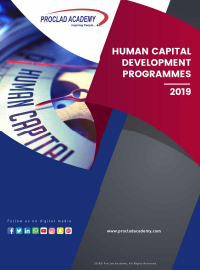 PROCLAD Academy’s practical and results-oriented Human Resource Management for Non-HR Professionals training course is based on adult learning concept. It incorporates short inspiring lectures with structured lessons from the learning manual, captivating PowerPoint slides with videos to enhance learning, ongoing discussions with action planning, ample time for Q&A, and training activities to reinforce key concepts within a fun learning environment. This training course will help participants to know their HR part to achieve the organisational goals through their team members. Does induction mean orientation or is there a difference?